Journey Blog Hop – Anything Goes – Welcome! If you arrived here from Susan’s Blog then you are right on track, if not just keep hopping until you come full circle. Most of my house is still packed up since we are kind of semi-homeless, with bare bones day to day items available, mainly kitchen & linens. However, since I was able to attend the Fun Stampers Journey Convention, I kept out all my products to create swaps with. I brought back several new goodies from convention & decided to use a new product with a mix of current & retiring items. Here is my card featuring the new Fun Stampers Journey Pan Pastels collection. I was so excited when they announced that FSJ was adding Pan Pastels to the catalog, because I have worked with them before & taken classes in Pan Pastels! 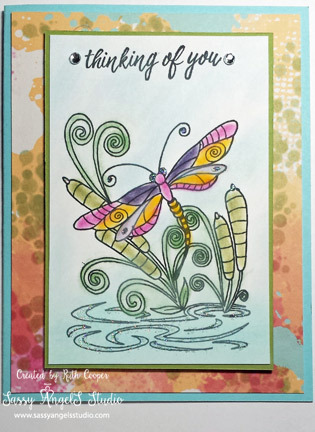 I used the sentiment from the Glass Blooms stamp set also from a Bloom Box but you will find it in the new catalog July 1st! After stamping both it was color time. We will have 4 new Pan Pastel color sets available & they come complete with Sofft tools to color with & palettes to hold your colors. I used a bit of color from all 4 collections. Pan Pastels work with just about everything. Cardstock, canvas, even on your Journaling Bible pages & doesn’t need to be set unlike traditional chalks & pastels, so very little chance of transferring color to other pages or items. It’s even erasable with a standard white or gum eraser. My card includes Pool Play, Lemon Grass & Whip Cream cardstock with Media Prints Paper (retiring June 30th), a dash of Journey Sparkle Dust & Cut Rhinestones. Easy, peasy, lemon, squeezy. If you would like a new catalog, would like to start a Bloom Box subscription or want to order some of these great supplies for your projects, click on the shop now button above. Just remember, new items won’t be available until July 1st. If everything goes as planned, we will finally get to move into our new home July 1st. I will have a new 486 square foot studio & classroom space. Stay tuned for upcoming class announcements. I have several fun projects planned featuring items from the new Fun Stampers Journey Catalog. Don’t miss out on the fun! Now hop on over to Betsye’s blog to see her fabulous creation! Beautiful Card. Love your use of the pan pastels. Beautiful!! Thanks for the information on the Pan Pastels!! Can’t wait to get mine!! oooo! That May bloom box was gorgeous and i wish I’d subscribed then! **sigh**The card came out beautifully! Thanks for sharing it! I love your card and your coloring with the pan pastels. I wasn’t signed up yet when Glass Blooms came out in the Bloom Box – can hardly wait to get it – but now I NEED the Color World set too!! Love your coloring with the PanPastels! I also got all 4 but haven’t had time to play with them yet! Beautiful card!! Love the colors of the pan pastels!!!? Your card is beautiful. That craft studio sounds divine, congratulations! I look forward to learning about pan pastels.